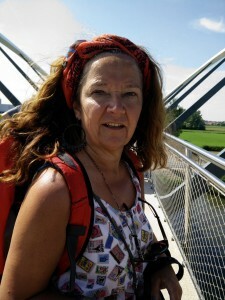 Home » Blog » Back Pain Speaks to “Self” through a Family Constellation. Ancestral consciousness can assist our body to represent the conflicts, which we need in order to fulfil our soul’s purpose. This is the story of an amazing young man, with a wonderful set of skills and accomplishments, with great possibilities to succeed in life and yet contained through a huge back pain since the age of 14. What is his back trying to tell him? We sit in a devoted group who is ready to delve deep into the constellation work in order to bring clarity to personal processes and through these into the world. You start the constellation with an interview, the case giver is invited to speak from the “I” perspective, to share the current situation and to describe the different stakeholders. It is good to invite the case giver to share his intention with regard to the outcome of the constellation. How does he want to be after this session? Our case giver has a back problem, which started at the age of 14. At this age his parents divorced after having been living apart for several years. The divorce inflicted important financial problems on his mother. The case giver feels he has to protect his mother and behave perfectly. Recently his back pain increased and now is also radiating towards his shoulders, blocking his ability to live his life to its fullest potential. His intention is to understand how his back is serving him. 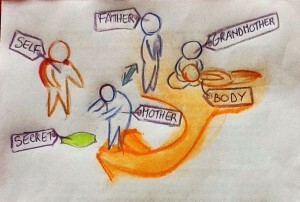 The facilitator proposes to set up the primary family system: the mother, the father and the self. She intuitively suggests to also represent the grandmother on the father’s side. The mother is in search of something that seems to be on the ground and is wondering why nobody takes note of this. A pillow is brought in to represent this so-called “secret”. The grandmother hides something. A representative is chosen to be a body, which is lying on the floor, probably someone who died. It becomes quickly obvious that there is a secret that the mother is obliged to hold in order to protect her son. 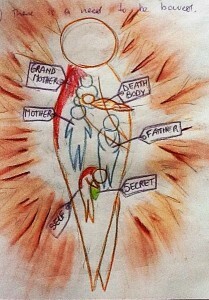 This secret does not belong to the mother it belongs to the father. This secret however cannot return to the father. The only journey the secret can take is through the son. It takes a while for the self to be able to receive the secret from his mother. It is very painful without knowing what it is he receives. Huge terror is created in self. The back pain in self increases. Self reaches out to his father to help him. Something happened in the past with the father. His mother, the grandmother protected her son and kept this secret hidden for the outside world. In one or another way this secret was transferred to her daughter-in-law. The father cannot own this trauma and even in the constellation is unable to look at it, accept it, process it. His son has to take it and he needs to acknowledge and accept that life comes from his father and from his mother with all that belongs to it. We have amazing intelligent physical bodies, they are our most intimate partners in this life. When there is a physical problem a constellation can reveal its ancestral consciousness with its underlying beliefs and constructs. Ancestral consciousness in this constellation is a secret, which creates a distortion in the field. The need to protect somebody is very present in this constellation. The case giver mentions in the interview the urge to protect his mother, in the constellation there is a huge need for protection from the grandmother towards her son and from the mother towards her son. It is important for the case giver to bring all the representatives into his inner being. The constellation is a mirror, a reflection of what happens inside. The secret, entanglement, construct or pattern from the past only serves to teach the self. The back pain can heal when time is ready and the teachings are integrated.